While we may not be handicapping full cards for the next couple of weeks, we will be picking out a few select races from around the country that we like to take a look at, and, perhaps, a shot at wagering. On Wednesday — the Fourth of July — we picked out two races at Ellis Park. We won one, and our “Upset Special” in the second, ran a solid third. Baffin (4): This is my top choice for this one, but the 3YO colt will be making his first afternoon performance since July of 2017 — when he ran a tiring fourth in the G3 Sanford Stakes at Saratoga. Obviously, something happened in that race to put him on the sidelines for nearly a year. But there are a couple of things that make him very interesting in this return to action today. One, he captured his debut appearance at Churchill downs last June, running off to an impressive, commanding and over-powering win by nearly 5 lengths. He was made the even-money choice in that one, and he beat a really nice horse that day in Wyatt’s Town. So, it proves that he can run very well fresh. Two, the barn of trainer Steve Asmussen thought so highly of him that they immediately shipped up to Saratoga to take on the likes of Firensen Fire and Free Drop Billy. Both of those won multiple Graded Stakes after that race, as well. Third, this one is training lights out for the return. He has fired two bullet moves in a row at Churchill Downs — on June 19 and June 27 — and looks ready for the return performance. If he is anything close to being the same horse that ran last summer? Watch out. Steel Shot (3): This one comes from the barn of Mark Casse, and he will be tuning up this afternoon for the first time since Jan. 5, when it appeared he blew a tire and ran nearly last in an allowance event at the Fair Grounds. Before that, though, he had two seconds and a win in the three previous races and ran a super impressive second to Land Battle in the Sugar Bowl Stakes on Dec. 16. If you go back in time, too, he has a win over Sir Sahib, a nice horse that recently won over the grass at Churchill. This one is training super nice for the return — and evidence comes on June 9 at Churchill Downs. May not be as fast as the top choice, but could be a stalking presence. Rubus (6): This son of Majestic Warrior cost the Rigney Racing LLC $260,000 to purchase at last spring OBS-April 2YO In-Training Sale. And, he looked like he would pay immediate dividend. He ran third on debut to a couple of nice ones, including Storm Runner. In his second start, he was second to eventual Fountain of Youth winner Promises Fulfilled, a speedster going just 6 furlongs. He broke the maiden in the third start and trainer Phillip Bauer then decided to drop him in the Street Sense Stakes going a mile. The top three finishers in that race were Gotta Go, Lone Sailor and Bravazo. Not bad, hey? He pressed the pace that day, but faded and has not been seen racing since. Today, he shortens back up to a distance that I think he prefers and he, too, has been training OK for the return to the afternoon. The work on May 15 was super impressive. The thing that troubles me the most, though, about taking a short here is that he missed his regular workout schedule from May 21 to June 16. Doesn’t show a published move since then, either. I may watch him today. Uno Mas Modelo (8): This son of Macho Uno is my “Upset Special,” to take a look at and consider. He may not be able to baffle Baffin, but this one already has 4 wins and 4 seconds under his belt in an allowance event for horses that have never — as in ever — won one race other than a maiden or claiming event. This guy has run 25 times to date, and he ran fourth in a nice Stakes event at Gulfstream Park back in February. Since getting the blinkers two races back, he has run two good ones — admittedly one of those was at Thistledown in Ohio, but… The last race win, in a stater allowance position, was super impressive. I take a shot at 8-1 ML. I bet the 4 to win/place/show and then key the 4 over/under the rest of the horses mentioned. The key to the card today, I think is the return of Baffin. 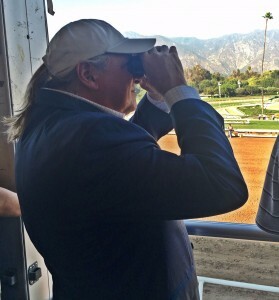 Watch the tote board closely, and especially early. If it lights up early, that may be an indication that he is sitting on go, go. Crosswalk (1): This is a key bet for me today, of all the races around the country. This horse went a mile in the slop at Churchill Downs on May 31 and ran a nice second to a really good one from the barn of Dale Romans in Seven Trumpets. The winner got away with an easy, impressive, and comfortable lead, and, really, all Crosswalk could do that day was purely “walk the dog” from the back of the pack and rally to get second. This son of City Zip did that, to the best of his ability, and easily distanced the rest of the field for the runner-up position as the odds-on favorite that day. Now, he cuts back to 6 furlongs for the first time since he ran at the Fair Grounds in March and broke his maiden. Should love this distance and the rail post is wining at 28% clip through the first couple of days of this meet. This trainer hits with .24% of those returning to the races as a beaten favorite. The odds are 2-1 ML, and may slide a bit lower. But if you can get even money or anything above, I am utilizing. At one time, the connections of this one were talking seriously about shipping up to New York for a try at the G1 Metropolitan Mile. Now, he is in this allowance race at Ellis Park. This one should air them in this spot today. I bet the 1 to win/place and then key the 1 over the “all button” in the exacta plays. I key the 1 in the horizontal plays today, as well.